ROADTRIP-'62 - Bridges, Bridges, and More Bridges! Bridges, Bridges, and More Bridges! Welcome to ROADTRIP-'62 ™ , as we discuss things from 1962! My name is Don Milne and I'll be your travel guide on this virtual tour of history. For our history talk this week, we'll be discussing bridges and how they relate to the world then, the world before, and the world today. This is part of my plan to discuss a different topic every other week, usually related to the segment of US-23 we just traveled the week before. I hope to allow those of you not familiar with 1962 a chance to learn, and those of you who lived it a chance to remember. By the time we travel the entire 1444 miles of US-23, we should all have a pretty good model of just what 1962 was all about! So get your toes comfy on a Lake Huron beach, pull out some of that Mackinaw City fudge we bought, and let's check out a little history. I'm going to begin this discussion on bridges with the big one we saw two days ago: the Mackinac Bridge. It was only completed in 1957 and so was still pretty new in 1962. Today, it carries I-75 over the Straits of Mackinac, but originally the bridge was signed as US-27. Because we keep building bigger and longer, it's now only the third longest suspension bridge in the world, but it was the longest from 1957 to 1998. In that year, two longer bridges opened: Japan's Akashi Kaikyo Bridge with a total suspension length of 12,826 feet and Denmark's Great Belt Bridge with a total suspension length of 8,921 feet. The Mackinac Bridge's suspension span is 8,614 feet. The bridge is very high at 200 feet above water level at mid-span: so high that my mother has never been comfortable crossing it. And, I have to admit that traveling suspension bridges can be scary under some circumstances. All suspension bridges are designed to move as needed to accommodate wind, temperature changes, and the changing weight of traffic. Under severe wind condition, it is possible for the deck at the center of the span to move as much as 35 feet left or right! Because of this, the bridge is closed when wind conditions warrant. The idea for a bridge at this point dates back to 1884, because it was realized that year-round ferry service across the Straits of Mackinac was a failure. Therefore, if a true east-west transcontinental route for either rail or road traffic were to be established through Michigan, a bridge or tunnel would have to be constructed. The Brooklyn Bridge in New York had been opened in 1883, so the concept of a suspension bridge of great length was proven. Within a few years, railroad companies began to view the idea with real interest, with Cornelius Vanderbilt of the New York Central Railroad noting that the Grand Hotel on Mackinac Island was one of the best hotels if its kind in the world, but suffered from a short business season. He felt a bridge would be helpful. Also, in 1889, construction began on the Firth of Forth Bridge in Scotland. But it was highway traffic, not railroad traffic that finally drove the idea forward. In the 1920s, many ideas were proposed to connect Michigan's two peninsulas besides the suspension bridge. These included a floating tunnel, and a series of bridges connecting various islands in the area, presumably to avoid the most dangerous crossing of the Straits. 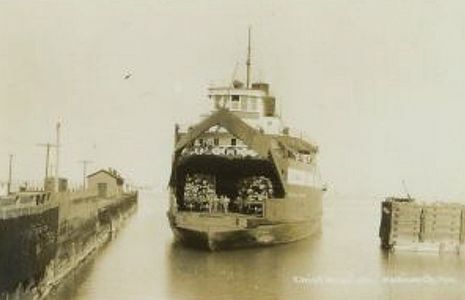 The car ferry service was established in 1923 by the State Highway Department and within five years this facility was so congested that the governor ordered a study of bridge feasibility. This first study found that a bridge was feasible and estimated the cost at 30 million dollars. By 1934, the bridge was proposed as a suitable federal Public Works Administration (PWA) project. The Michigan Legislature created the Mackinac Straits Bridge Authority to further study the feasibility of a bridge, and to finance the work by revenue bonds. They attempted to obtain federal loans and grants in the 1930s and received endorsement of the U.S. Army Corps of Engineers. The War Department actually performed some depth soundings of the channel for use in design. The proposal at that time was for a combined highway and railroad bridge, showing the importance that railroads still held. Designs of approach routes were made, as were soil borings and studies of water currents, ice and traffic estimates. Finally, between 1936 and 1940 a causeway extending 4,200 feet out from St. Ignace was constructed. As with a great many projects of the period, World War II intervened and bridge progress came to a halt. The Mackinac Straits Bridge Authority was temporarily abandoned between 1947 and 1951, but the problem of connecting the peninsulas forced it to be recreated. Again in 1951, the Authority submitted a very favorable preliminary report, stating that a bridge could be financed with revenue bonds. But over the years the expected cost had ballooned to $86,000,000! To make the bonds more attractive to private buyers, the Legislature in 1953 promised to pay operating and maintenance costs of up to $417,000 annually out of gasoline and license plate taxes. By the end of 1953, $99,800,000 worth of Mackinac Bridge bonds were sold and contracts for bridge work were let. When the bridge opened on November 1, 1957, it was on schedule, despite the hazards construction within the Straits of Mackinac. In fact, construction was so dangerous that five men died during the project. As noted, suspension bridges have been used to span long distances for over a century. But this is only for modern, steel-cabled structures. Other types of such bridges have been built as far back into history as the 3rd century BC, in China. Some of the earliest suspension bridge cables were made from twisted grass, a material which is still used in Asia for some pedestrian bridges. Ropes of various fibers were later used, with ancient Incan bridges being the best known examples. There are also examples in China of bridges with bamboo cables. These older bridges hung the bridge deck directly from the supporting cables, so that both had the same sag in the center. When iron and later steel began to be used for the cables, they were rigid enough to allow the deck to remain relatively level by varying the lengths of the hanging members, and thus was born the modern suspension bridge, dating from the early 1800s. A single steel wire of 0.1 inches diameter can support over a ton: modern cables are made from dozens or hundreds of steel wires. The defining features of all suspension bridges are the main span cables, the suspending hanger cables and the anchorages for the main cables in the ground. The towers that hold the main cables may be either at the ends of the bridge or somewhere within the area to be spanned. The anchorages can be either directly into the bedrock or in poured concrete blocks larger than homes. While it looks like the towers are doing most of the work, most of the weight is actually distributed to these anchorages. The road deck is suspended from the hanger cables, which transfer the weight to the towers. Both the towers and the anchorages then transfer the weight to the ground. The first design for a bridge that resembled modern suspension bridges in Europe is attributed to Faust Vrančić. His 1595 book 'Machinae Novae' included drawings two types of suspension bridges: timber-and-rope and a hybrid of a suspension and a cable-stayed bridge that used iron chains. James Finley constructed an iron chain bridge at Jacob's Creek, Pennsylvania, in 1801, becoming the first of this design. This bridge attained wide notoriety and from about 1810 a rapid period of development of the modern suspension bridge occurred. A suspension bridge has several advantages, and disadvantages, compared to other types of bridges. Advantages include: the suspension bridge is much simpler to design and analyze than a cable-stayed bridge, you can achieve longer main spans than with any other type of bridge, they require little access from below during construction, the strands in the cables allow for an extra measure of safety because if a single strand fails, there are still many holding the bridges, and they can often withstand earthquake movements better than heavier or more rigid bridges. Some disadvantages are that additional deck stiffness or aerodynamic shapes may be required to prevent the bridge deck vibrating in high winds and this low deck makes them less suitable for rail traffic's highly concentrated live loads. But what, you may ask, ARE the other types of bridges? Glad you asked. People have discovered a variety of types of bridges, constructed of just about every material at hand. One of the easiest to build is a simple beam bridge, such as a log across a stream. Only a little more work was needed to use a large stone slab set upon some piles of rock for foundations. Longer lengths could be accomplished by piling rock in the stream to form piers and then using multiple spans of logs between the piers. The modern descendent of a beam bridge is the pre-stressed concrete beam bridge. In this, beams are constructed of concrete with steel reinforcing, and the various length beams are set across piers. Most modern freeway bridges and many river bridges along US-23 are of this type, as it is relatively inexpensive and quick to erect. The next more complicated type of bridge is an arch bridge, developed to a high degree by the Romans. In this type, longer spans are possible than for a beam because the weight is distributed around and down the arch, instead of depending on the strength of the beam. Some stone arch bridges with massive 8-ton blocks have been standing for over 2,000 years. A refinement of the beam bridge known as the cantilever bridge involved lying the beams across piers, such that the piers hold the weight and there are gaps between the beams reaching from successive piers. This also allowed for longer lengths and even held buildings for shops along the bridges, because the piers did most of the work. There is also a modern version of the masonry arch bridge: the reinforced concrete bridge. In this style, the individual stones are replaced by a single (or sometimes multiple) man-made steel-reinforced concrete "stone." There are several of these along US-23, including a real stone arch bridge in Fenton, Michigan. An example of a concrete arch on US-23 is the Scott Creek Bridge in Sylva, North Carolina. These bridges are usually over rather smaller rivers. However, these bridges can be constructed over very long spans, like the Cherry Street Bridge shown above, and high above the river they cross. The concrete arch has been used extensively and very gracefully in Switzerland, France and the Scandinavian countries, crossing deep mountain valleys. One type of bridge erected often during the 1800s is the truss bridge. This is really a variation on a beam, with the solid beam replaced by a latticework of wood, iron or steel trusses to distribute the weight. In effect, the beam has been hollowed out and you drive through the middle! The defining feature of a truss bridge is the repeated triangular shapes, used because a triangle cannot be distorted by stress. A suspension bridge supports a road from above, an arch bridge supports a road from below, but a truss bridge merely makes the roadway stiffer and stronger. Various types of trusses were devised including the Howe Truss, Kingpost Truss, Queenpost Truss, Town's lattice truss, bowstring truss, Allen Truss, Bollman Truss, lenticular truss, Brown truss, Pegram truss, Warren Truss, Pratt Truss, and many more combinations of trusses and arches. Many of these designs were patented. The Kingpost is one of the oldest types because it is the most basic. The outline is a simple triangle of two diagonals and a bottom chord, with a vertical member called a Kingpost dividing the triangle in half. These work well for shorter spans, up to about 35 feet, as it becomes difficult to find and erect single beams longer than that. The Queenpost is another early and basic type, and is a simple variation of the Kingpost truss. A Queenpost truss spreads the two diagonal members out, so they do not meet in the center and fills this gap with a horizontal chord member. Two vertical members are then used, one to connect each diagonal, resulting in a three panel span. After this, additional triangular panels with additional diagonal members, vertical members, and cross-bracing are added, resulting in the large variety of truss styles. The only version where you cannot see the trusses is the wooden covered bridge. These were covered to protect the supporting timbers from the weather, with inexpensive wooden sheathing that could be replaced as needed. There are several places along US-23 where a slight detour will take you to some remaining covered bridges, such as near Upper Sandusky, Ohio and Graysbranch, Kentucky. A type of bridge that many find graceful, but I find too angular, is the cable-stayed bridge. Cable-Stayed Bridges look similar to suspension bridges because they both have towers and roads that hang from cables. The difference is that in cable-stayed bridges, all the work is done by the towers. In these, the cables all hang directly from the towers. There are two versions of this bridge, one with a radial pattern of cables all extending from a single point at the top of the tower. The other version has a parallel pattern, with the cables attached at various heights down the tower. These bridges look futuristic, but the idea is as old as 1595. Perhaps it is because of the style, or because they use less steel and use precast concrete sections that save money, that these bridges are quickly becoming the bridge of choice where suspension bridges used to be constructed. We will see one for ourselves at Portsmouth, Ohio, where the U.S. Grant Bridge we'll cross over the Ohio River is a new cable-stayed bridge to replace the suspension bridge that was there in 1962. The original U.S. Grant Bridge was constructed in 1927 and demolished in 2001. This was a suspension bridge with a single, two-lane center span of 700 feet, using steel cables. We would have crossed it in 1962, as it was the only highway bridge at Portsmouth to cross the Ohio River from 1927 to 1984. It was originally a toll bridge, owned by the Ohio Bridge Commission, and we would have paid that toll in 1962. The State of Ohio purchased the bridge and removed the tolls in 1974. The state then spent over $9 million to repair and rehabilitate it between 1977 and 1996, but the bridge was finally found to be structurally obsolete and deficient for current and future traffic needs. After many cost and design estimates, it was finally decided to replace it. The new cable-stayed bridge opened in October, 2006, with a main span of 865 feet and a tower height of 292 feet. There are also several designs of moveable bridges. We usually call these all drawbridges, but the several types are more properly vertical lift bridges, swing bridges, rolling lift bridges, and bascule bridges. A vertical lift bridge has towers at each end and the entire span rises and lowers to clear the waterway for ships. In a swing bridge, the span is swung horizontally, often rotated around the center pier. One problem with this type is that it has to swing over the waterway, thus obstructing it. Or, if swung from one shore, it needs space on that shore to fit when open, obstructing docks. A rolling lift bridge is the only moving bridge type that does not use large counterweights. In this style, the deck sections roll back away from the shipping channel on tracks, under the roadway on the shore. The bascule bridge has been used since the Middle Ages: it is the type we associate with castle moats. In a bascule bridge, the span is raised and lowered like your arm, hinged at the elbow. These bridges can have a single lift span or one on each shore. One moderately famous bascule bridge was located on US-23/I-75 at Zilwaukee, Michigan. The Zilwaukee Bridge was a two span drawbridge, constructed in 1960. The reason it was famous is that it was one of very few drawbridges constructed on an Interstate freeway. The idea of the Interstates was that there would be no stops or traffic signals, but a drawbridge required both whenever a ship crossed. Besides the normal traffic backups whenever the bridge opened, the river channel under the bridge was narrow and several ships actually hit the bridge over the years. This caused damage and additional backups on the freeway. It continued to obstruct both highway and river traffic until 1988, when a high-level bridge was opened that went above the shipping channel on the Saginaw River. One other beautiful bridge that was on US-23 back in 1962, but that the highway has bypassed since, is the Anthony Wayne Bridge over the Maumee River in Toledo, Ohio. This is another suspension bridge, with a center span of 785 feet. It was constructed in 1931, rehabilitated in 1961 and again in 1998, when 240 suspender cables and anchorage cables were replaced and the main cables were re-wrapped. The latticework of the towers and decorative sidewalk railings help create a very pleasing view. Currently, OH-2 crosses the bridge: I have not been able to find the date when US-23 was moved, though it may have used the nearby Cherry Street Bridge for some period. The year 1962 saw the completion of several major bridges around the world. At Sault Ste. Michigan / Ontario, the International Bridge was completed in October, with a total length of 2.7 miles. Also in October, a new bridge over the Niagara River at Lewiston, New York to Queenston, Ontario was opened. This was the world's longest fixed steel arch bridge, spanning 1,000 feet. Yet a third bridge between the United States and Canada was opened in July, across the St. Lawrence Way at Cornwall, Ontario. This bridge connected to the portion constructed in 1958 by the United States. Uniting South America and North America with a mile long bridge, the Thatcher Ferry Bridge was constructed across the Panama Canal. Another project expanded the capacity of the George Washington Bridge in New York City. Six new lanes were added as a lower deck to this existing eight-lane bridge across the Hudson River. This change used part of the bridge originally planned for rapid transit trains, but the need for more auto capacity trumped the need for more trains. Our year of 1962 also ensured that no changes would be made to the Golden Gate Bridge in San Francisco, California. A study was completed in 1962 for the Bay Area Rapid Transit (BART) system that found addition of rapid transit trains would degrade the safety of the bridge and shorten its life. As a result of this study, you can still see the original bridge and the BART trains run through a tunnel. One odd coincidence on our trip down US-23 is that we begin just a few blocks from the Mackinac Bridge at the north end, and we end just a block from the Main Street Bridge in Jacksonville, Florida at the south end. This final bridge is a vertical lift bridge with Warren trusses and 40 feet of clearance when closed. It has 200-foot tall towers and a 365-foot lift span which is the longest in Florida. The bridge opens for ships on demand on the hour between 9:00am and 4:00pm, but they will not open it for you at all during traffic rush hours in the morning or afternoon on Monday through Saturday. The Main Street Bridge opened in July, 1941 and was officially renamed the John T. Alsop, Jr. Bridge in 1957, after a mayor of the city. As a teaser for the end of our road trip, I crossed the bridge and snapped a photo from the park on the south bank of the St. John's River. So, now that you know all about bridges, you can bridge spot as you travel. But here, it's time to go back to our ROADTRIP-'62 ™ journey. See you next week on old US-23!